For the 8-bit Labyrinth Zone, see Labyrinth Zone (8-bit). 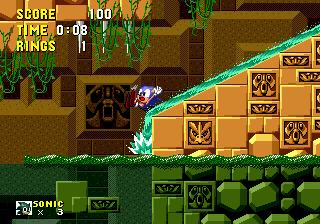 Labyrinth Zone, the fourth zone in Sonic the Hedgehog, is a ruin-like maze zone, most of which is underwater. It features many spikes, Fire-Breathing Statues, and water-driven contraptions. The greatest hazard of this zone is not the enemies or the traps, but the water. Sonic, being a hedgehog, is terrible at swimming. After staying underwater for a limited amount of time (18 seconds, with warning bells at 5, 10, and 15 seconds), a countdown begins (5 breaths/about 12 seconds), at the end of which Sonic automatically drowns. Collecting air bubbles found in certain points resets the counter and prevents Sonic from drowning. This element has found its way into many more Sonic games, much to the dismay of most players. This zone was originally supposed to be the second zone instead of the fourth, according to the unaltered Level Select menu. It is theorized to have been switched with Marble Zone in terms of level placement due to its higher difficulty. Lost Labyrinth Zone from Sonic the Hedgehog 4 seems to be based on this level. The first part of the boss fight in Sonic 4 is the same as this one, and Lost Labyrinth has the same badniks of this level. Burrobot — Mole bots that leap from the ground and then simply move back and forth in a small area. Jaws — Piranha bots that troll around underwater. Unidus — Simple, pissy-looking sphere bots that move back and forth very slowly. The catch is that they're circled by four spiked balls, making them virtually impossible to hit until after they've spotted you. The end of Act 2 is one of the glitchiest places in the game. There are 3 bonus points above the 6th block in the ground (from the edge where the final stretch starts) that are too far away from the signpost. As a result, their graphics aren't loaded, so if the player manages to get them, their sprites will be garbled. The screen doesn't lock correctly, so if, after getting the aforementioned bonus points, the player goes back to the left a bit, the signpost object will be unloaded and won't return when the player goes to the right again. This doesn't apply for the Giant Ring. If the player runs towards the signpost, and starts holding down around the time the signpost is crossed, Sonic will start a roll, eventually stop off-screen, the screen will scroll down, and the game will crash. Some debug data is displayed, and can be scrolled with . In Act 1, when the player goes into an underwater, partially open area with a button and 2 raising platforms, if they press the button, and ride the platform under it, they will be able to go back up from where they came, where they'll see a platform. Riding this platform will lead to a shortcut. This path also contains an extra ring, albeit only in REV01 of the game. This page was last edited on 27 April 2018, at 15:33.